What’s It About: A society that burns books, thus destroying citizens’ capacity for independent thinking. Aka, every young person’s introduction to dystopic fiction. Why: Every young person, that is, except for me. I somehow managed to graduate junior high, high school, and college without this book being thrust upon me. Well, Ray Bradbury apparently can. Montag effectively goes from brainwashed fireman, blindly participating in his society’s eradication of literature, to a rebel in, oh let’s say, 3 pages? I have no idea how he got there or why. And don’t tell me that Clarisse changes his ways, because we happen to know that Montag is hiding books long before she comes around. So the opening lines of hypermasculinity, of pure faith in a corrupt system, and really rendered useless because they go no where. And Montag’s character remains just as bland and lifeless as the Hound-animal-machine-thing-idontknowwhat. Ok, maybe I’m being a bit harsh. The writing’s not terrible. There’s some really beautiful imagery in many scenes. 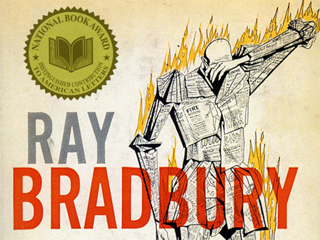 And Bradbury’s vision is quite prophetic and pinpoints the trajectory of contemporary American pop culture. But otherwise, the storytelling reminds me of some of the terrible scifi short stories I read while researching SF pulp magazines for my undergrad thesis. Like I said, Montag has no character. And I often felt like many of the novel’s events had no precedent, no cause or effect. It feels a bit like the kind of book that seems awesome when you read it in junior high, but then disappoints when read as an adult. As a soon-to-be teacher, part of my reason for reading this book was knowing I might actually be teaching it some day. My conclusion is that there are better alternatives- Hunger Games, 1984, The Giver, Armageddon Summer, Never Let Me Go to name a few. Oh, and did you happen to know that Ray Bradbury doesn’t care for minorities?– that when he writes in the novel that the minorities were the ones who began the book burnings, he really means it? I suggest you read this: http://www.rjgeib.com/thoughts/451/451.html which was included as an epilogue to my edition of Fahrenheit 451. I am however, excited to see Truffaut’s film adaptation. Maybe he’ll actually do the idea justice. It feels a bit like the kind of book that seems awesome when you read it in junior high, but then disappoints when read as an adult. You’re probably right. I read this in middle school and adored it, but maybe it doesn’t hold up when you’re older. I had a similar experience to yours while reading The Fountainhead as an adult. I’m really impressed together with your writing talents as neatly as with the structure for your weblog. Is this a paid subject matter or did you modify it yourself? Either way keep up the nice quality writing, it is rare to peer a great blog like this one these days..
We made the structure ourselves, with the help of wordpress themes, of course.